Walkabout - What do nature photographers do at night? What do nature photographers do at night? I bet you’ve asked yourself that dozens of times, haven’t you? Admit it. Well, the answer is, “Pretty much the same thing other people do.” Now that I’ve resolved that burning issue for you, you can remember me in your will. But, from the more egocentric universe of this blog, on occasion, nature photographers (meaning me) venture out and try to find things not visible or possible during the day. This may include long exposures by moonlight (I’ll have a post on that later on), starfields, or nocturnal critters. A few nights ago, I strolled around my property with an LED headlamp to see what I could find. The days had been very hot and humid, and the night was only slightly less so, but this meant the dew was slow in coming. The first interesting thing I found was something I’d heard about before, but never witnessed very often. Having a light source fairly close in line to your eyes (in this case, emanating from approximately the center of my forehead) can show some distinctive reflections that aren’t visible if the light is farther away. 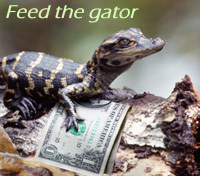 I’ve used this before to find alligators at night, back when I lived in Florida – their eyes produce a brilliant orange reflection almost as bright as a highway marker. Tonight, the effect was dimmer but a rich blue-green color, a tiny star on the ground. It’s hard to believe this until you see it, and the picture doesn’t do it the justice it deserves, but the cause of this is simply a wolf spider – okay, that’s exceptionally vague from an entomologist’s standpoint, since that applies to literally hundreds of species, but I’m too lazy to try and determine the proper one right now. More specifically, though, and to sidetrack you from my scientific failings, the reflections come from the eyes. It can be seen from several meters away, very distinctly, and it can take a very close approach before you can even see what causes it. 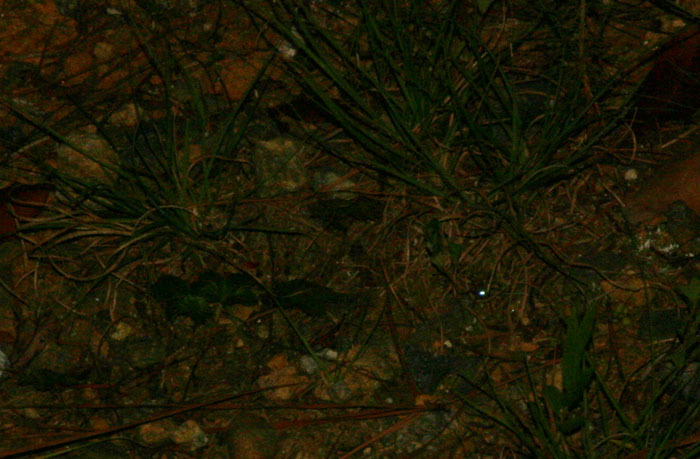 In a few cases this night, the culprit was mostly hidden under leaves and invisible as I got close. Now, if the blades of grass don’t give you enough of an impression, I can tell you that this one was less than 2 centimeters across, a mere postage stamp in size across the leg span. From this angle (especially with the angle of the camera-mounted strobe), the eye reflection doesn’t occur, so once you get closer you have to pinpoint the location as the reflection fades and disappears. Consider the size of the eyes, though. If you supposed they were about half the diameter of a straight pin head, you’d be right, if not overestimating a bit. But this tiny little surface not only bounces back the light, I think it magnifies it. It’s quite impressive, and the smaller ones seem like they’re much brighter – spiders the size of my fingernail were producing the most significant starpoints. 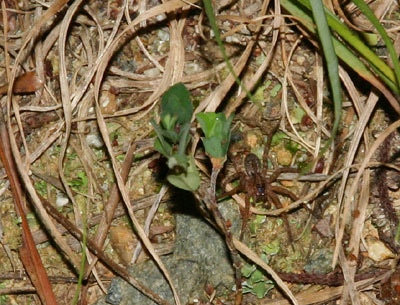 While I was poking around very close to the ground, I spotted another arachnid, a shy one that many people never see here in North Carolina even though they’re fairly common. This one was very shy and took cover in the lee of a clump of lichen and a rock, and my patience wasn’t working, so I cheated a bit: I caught an ant and tossed it into the web. Ah, that did it! 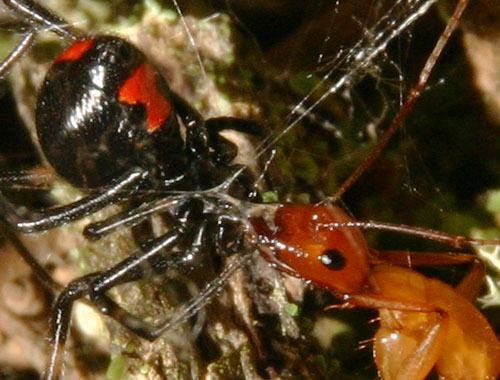 Yes, you’re looking at an infamous black widow, in this case a southern black widow variant, Latrodectus mactans, and a female to boot. This one is quite small, maybe three millimeters across the abdomen – small enough that most people wouldn’t have a clue it was there, unless they were lucky enough to spot the distinctive red hourglass on the underside. That distinctive mark isn’t always the same shape, though, and being on the underside it’s possible to miss. 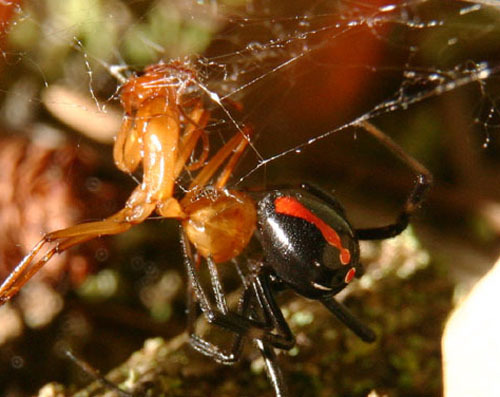 The black widow helps, though, because it often hangs belly up in the web. That is, if it hasn’t been spooked into hiding. By the way, while the venom is quite potent by human standards, in rare cases enough to threaten life, most cases result in a few days of illness and discomfort. There is a possibility that I received a bite many years ago, since it matched some reports of the symptoms, but not others, and I never saw the culprit – the symptoms can be very similar to Lyme disease and other tick-borne illnesses, so many suspected spider bites actually aren’t. I never found a tick there, either, and they usually have to be attached for hours to transmit their diseases. The southern variant has some markings that can be seen here, usually a string of three dots on the back of the abdomen, but the variation in these markings tends to be extensive – in this case they’ve kind of smeared, so I’m thinking she was in a hurry and didn’t let them dry thoroughly (and how are you gonna blow on your own back?) But these markings are how you distinguish the Southern variant from others. I had a little serendipitous assistance with this illustrative photo, too: the quartzite rock that formed part of her shelter, glimpsed at the right of the image, served as a fill light reflector that helped illuminate the detail. There was one more detail I caught in my string of photos, then I’ll stop grossing you out (though it’s been fun). Seen in this tighter detail from the first pic, you’ll notice that the ant’s mandibles are entangled with a nice gob of extra-sticky silk. 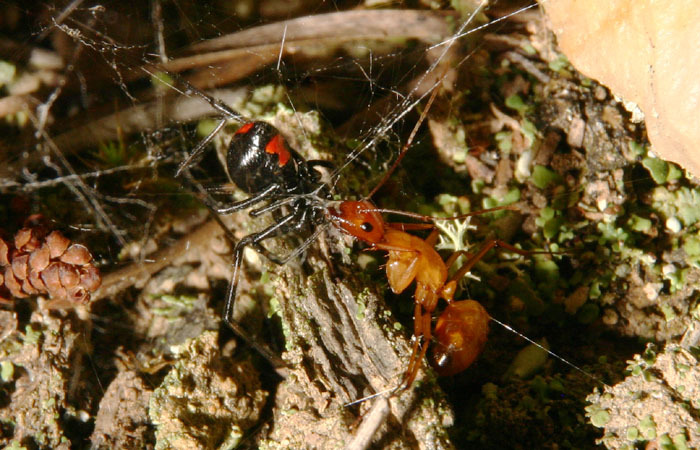 Spiders, as tiny as their brains are, know what they’re doing, and despite the fact that her venom is certainly turning the ant’s insides into a red ant slurpee, she took steps to protect herself. Most spiders can extrude several different kinds of silk, including some bad tasting dewdrops to discourage predators (I have to admit I do not speak from experience, weird as I am). So, um, yeah, that was my night. Aren’t you glad you asked?